Designers used to inspire us what to wear, but no longer, because fashion has become about giving the people what they want. Fashion design has gone upside down! A while ago I watched a David Bowie documentary, in which he talked about his mainstream period, when he wrote songs as ‘Modern love’, ‘Let’s dance’ and ‘China girl’. He said; if you want to make a lot of money, you have to give the people what they want (after some time, this way of working made him feel creatively bankrupt) and that is what’s happening in fashion at the moment! No longer is fashion about designing, but it’s about making lots of money. First brands did anything to become well-known (shocking campagnes,outrages designs,billboards on every corner of the street and hiring famous designers), so their names were buzzing and people who couldn’t afford to buy the clothes, were at least triggered to buy the perfumes, bath oils and soaps. Than accessories like shoes and bags became an important trade income (and still is) and now it’s the clothes they bring on the market, that have to push up sales to extreme heights. To get huge sales, they have to be sure people are going to buy the clothes and there it is: giving the people what they want!To understand what it is they want, designers look at what people wear already…and bring these items on the market, but with their famous label sewn in. They bring T-shirts with their logos largely printed on the front or vintage looking graphics, ripped and bleached jeans, inspired by bikers, vintage army-look and all this for outrages prices! 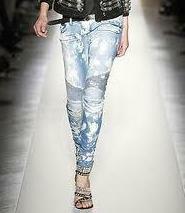 A few seasons ago, Balmain ‘launched’ the bleached and ripped skinny jeans for about €2.000,- and these sold out in no time. What is new about a ripped and bleached pair of jeans?! Ofcourse there are still designers going for creativity, but fashion has suffered a lot from this mainstream way of working, like it suffered from brands as H&M, Zara, Topshop and Bershka, who copy designers largely and therefore make it less tempting to buy ‘the real thing’. A reason for designers to make special collections for H&M, so they can at least profit from the brand, that copies them…..! ?Fashion upside down? Video might have killed the radio star, mainstream thinking and pressure from important investors have made fashion design creatively bankrupt!